When Shopping on Amazon.com, please click here first! By shopping through Amazon's "smile" program, Amazon will give some of their profits to our Booster club! Elementary Music! Loomis Music Website! Click Here!Click Here! We are always in need! Please contact Band Director Ben Duncan. Check out the Band Calendar on the bottom of this page for updated schedule information for all band classes. If you accessed this site through the Del Oro home page, get here directly using deloroband.com. Please see the Documents page for any needed forms or information. 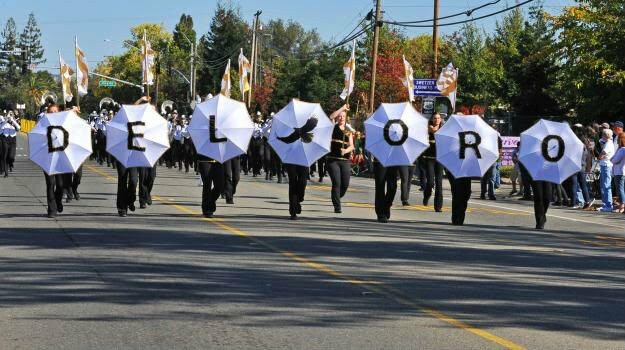 We, the Del Oro Golden Eagle Band, as a unit are committed to maintaining a welcoming student driven organization and an uncompromising work ethic, while exceeding expectations through innovation. We pride ourselves in our enthusiasm, professionalism, and respect for ourselves, our school, and our community, while upholding and building upon our legacy. Punctuality/Attendance: Each Student will strive for perfect attendance and will arrive on time. Students will not miss performances. Behavior: Each student will behave in a manner that is conducive to individual and team success and will do their part in creating a professional learning environment. Communication: Each student will learn to communicate with peers, instructors, parents, and the director in a way that is appropriate and respectful. Preparation of class materials: Each student will have whatever items required for the rehearsal, activity, or performance. This may include clothing/uniform items, music, pencils, instruments, equipment, props, and so on. Students will also endeavor to treat the rehearsal space and any equipment with respect and care. Organization and Planning: Each student will be responsible for the schedule of rehearsals and performances and will plan ahead to prevent schedule conflicts. When applicable, students will help plan and organize team social activities. Teamwork: Each student will learn and demonstrate the skills required to work as a team. Students will not be selfish when making choices. Leadership: All students will understand basic principles in leadership. Qualifying, experienced students will demonstrate advanced leadership skills through participation in band council, serving as a section leader, squad leader, or becoming a band manager (trailer crew, loading crew, uniforms, equipment, etc.). All students will lead by example. Memorization: Each student will memorize any required music/drill/routine accurately and in a timely fashion (not all music is required to be memorized). Technical Skill Development: Each Student will strive to make significant improvement in musical skills such as: Tone, Dexterity, Support of Sound, Purposeful Breathing, Articulation, Rhythmic Control and Understanding, Music Reading Skills, and Intonation. Guard students will improve in movement and equipment skills. Music Theory: Each student will understand concepts such as Notation and Clefs, Scales, Intervals, Chords and Harmony, Keys and Modes, Transposition, Compositional Structure, and Basic Composition. Mastery of Repertoire: Each student will strive to achieve their best personal understanding of selected pieces. Performance of Repertoire: Each student will demonstrate maximum effort in performing selected pieces.